Espressif Systems is a world-leading Internet-of-Things company. Espressif built the widely popular ESP8266 and ESP32 chips. 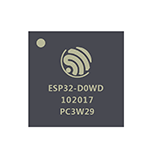 Espressif is an innovative team of chip-design specialists, software/firmware developers and marketers. And we are committed to providing the best IoT devices and software platforms in the industry.